“Lighting the fire during a cold winter evening at resident of Vladivostok. Scientists suggest that it was not created by nature but was rather manufactured by someone. The question of who might have made an aluminum gear in the dawn of time remains unanswered. Today finding a strange artifact in coal is a relatively frequent occurrence. The first discovery of this sort was made in 1851 when the workers in one of the Massachusetts mines extracted a zinc silver-incrusted vase from a block of unmined coal which dated all the way back to the Cambrian era which was approximately 500 million years ago. Sixty one years later, American scientists from Oklahoma discovered an iron pot which was pressed into a piece of coal aged 312 million years old. In 1974, an aluminum assembly part of unknown origin was found in a sandstone quarry in Romania. Reminiscent of a hammer or a support leg of a spacecraft “Apollo”, the piece dated back to the Jurassic era and could not have been manufactured by a human. All of these discoveries not only puzzled the experts but also undermined the most fundamental doctrines of modern (pantheistic) science. The metal object was pressed into the coal. The coal was delivered to Primorye from Chernogorodskiy mines of Khakasia region. This dates to about 300,000 years. 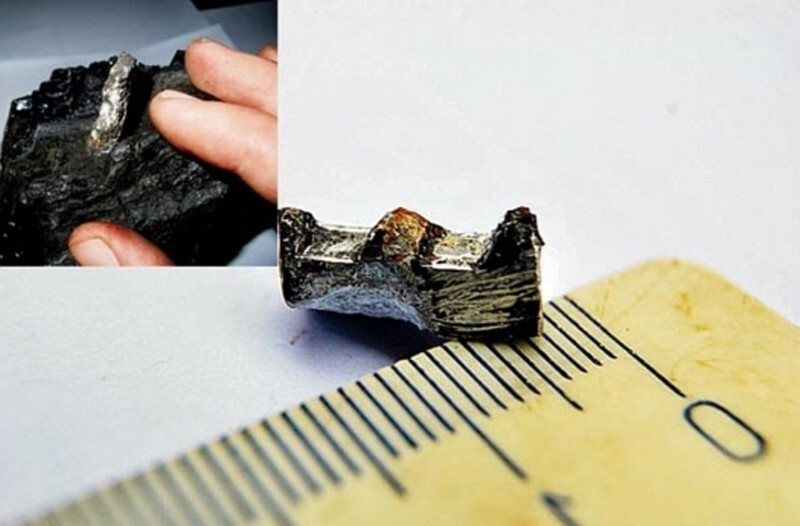 Russian experts inferred that the metal detail found in these deposits must be an age-mate of the coal. The object was found to be composed of 98 percent aluminum and 2 percent magnesium. An alloy stalled the scientists because nearly pure aluminum is very rarely found in nature. Thus, the detail was most definitely created artificially. Pure aluminum is increasingly prone to oxidization. This contributes to the creation of a special layer protecting it from further corrosion. As a result, the metal detail made 98 percent from aluminum. It can endure not only high pressure but also heat and other severe conditions. The last property of the object that puzzled the scientists was its distinctive shape. This which was reminiscent of a modern tooth-wheel. It is impossible to imagine that an object could take regular shape of a tooth-wheel. Especially one with six identical ‘teeth’ occurring naturally. The intervals between the ‘teeth’ of the gear are curiously large in relation to the size of the ‘teeth’ themselves which might mean that the detail was a part of a complicated mechanism. Nowadays, such ‘spare parts’ are used in construction of microscopes and other mechanical appliances. This poses yet another unanswerable question : how can the metal tooth-wheel be 300 million years old if the regular-shaped ‘wheel’ itself was created by man millions of years later. This is just one more item which demonstrates that the pantheistic or long-age time-line popularized by evolutionists is grossly inaccurate. One more oopart to add to the list.